Some carillons and chimes in North America were installed temporarily in expositions or fairs of various kinds. Many of these were later reinstalled elsewhere. Other carillons were relocated from their original places of installation for various reasons. And some have been destroyed or stolen, and were not replaced. There are no site data pages for such sites, so they cannot be indexed in the same manner as extant instruments. Hence this page. The lists below present, in appropriate orders, the original locations of such instruments, without distinction between traditional and non-traditional mechanisms. NOTE: Tower bell instruments which have been down-sized (e.g., from carillon to chime) or downgraded (from traditional to non-traditional action), but which remain in their original locations, are not listed here. They can be found on a page about degraded instruments. The carillon built by Bollée of LeMans for St.Joseph's Cathedral, Buffalo, NY (see below) was exhibited here before export to the USA. The traditional carillon built by Gillett & Johnston for Simcoe, ON was exhibited here before export to Canada. A Michiels carillon which was displayed here became the foundation for the present traditional carillon of Norwich University, Northfield, VT.
A Michiels carillon which was in the Belgian Pavilion is now in Stanford University, near Palo Alto, CA. A vanBergen carillon which was in the Dutch Pavilion is now in Greenwood, SC. A smaller vanBergen carillon, which was the "Garden Carillon" in the Dutch Pavilion, is now in New Brunswick, NJ. The Eijsbouts foundry displayed a 28-bell carillon, the disposition of which is unknown. A 13-bell McShane chime which was exhibited in the Machinery Hall is now in Garden City, New York. McShane reported making a 15-bell chime for exhibition here, and later reported making a 10-bell chime for the Cathedral of the Immaculate Conception, Saint John, New Brunswick. But the Cathedral has documentation that its 10 bells were made for the Exposition. The other five bells are presumed to have been dispersed. A 10-bell chime was exhibited by Vanduzen, and may have been the first chime they ever made. Both Nashua, NH and Oakland, CA have claimed to have this chime now, but additional research has shown that Nashua's claim is correct. See the following paragraph for the actual origin of Oakland's bells. A 10-bell chime was installed by Vanduzen in the southwest tower of the Manufactures and Liberal Arts Building. Reportedly it was modelled on that which Vanduzen had made for the Chicago exposition (see above). It was played two or three times each day by Professor W. H. Holt, organist of St.John's Church, although at least once the breakage of transmission wires prevented its being heard. After the fair, the chime was bought by David Hewes, who intended to donate it as part of a clock tower to be built at Stanford University as a memorial to his second wife, who had been a sister of Mrs. Leland Stanford. That clock tower was never built, possibly because agreement on its location could not be reached. It is believed that these bells were eventually purchased in 1902 for Mills College, and were installed there in 1904. The bookstore of Whittemore Associates had a light 25-bell carillon by Petit & Fritsen on its façade from 1951 until 1965, when the company and the carillon moved to Needham Heights (see below). The bells of the little automatic carillon installed in the College of St.Mary of the Plains in 1953 were sold to North Hennepin Junior College, Minneapolis, MN in 1994. First-Calvary Baptist Church was located here when they bought a light carillon from Whittemore Associates in Needham Heights (see below), but they have since moved to North Andover, MA. The 4-octave tower carillon was sold to Berea College, Berea, KY, where it eventually became part of the present traditional carillon. The 3-octave traveling carillon was sold to an anonymous investor, and is now based in Pennsylvania, where it is part of the musical group "Cast in Bronze". The second 3-octave carillon, never installed, was sold to the Polytechnic University of Puerto Rico (UPPR), where it is played only automatically. The heaviest 11 bells went to Belmont University, Nashville, TN, where they were used to extend that instrument's treble range. The middle 7 bells went to the Deeds Carillon, Dayton, OH, where they were used to extend that instrument's treble range. The lightest 5 bells went to Berea College (see above), to increase the range of that instrument. A 23-bell carillon was installed at this school by Gillett & Johnston in 1928. In 1952 this instrument was sold t Schulmerich Carillons, Inc., Sellersville, PA, where it remained until the demise of that company in 2012. The bells have now been recycled into a mobile non-traditional carillon owned by the Virginia Arts Festival. Ward-Belmont School was eventually succeeded by Belmont College, which acquired a new carillon in 1986, and later became Belmont University. 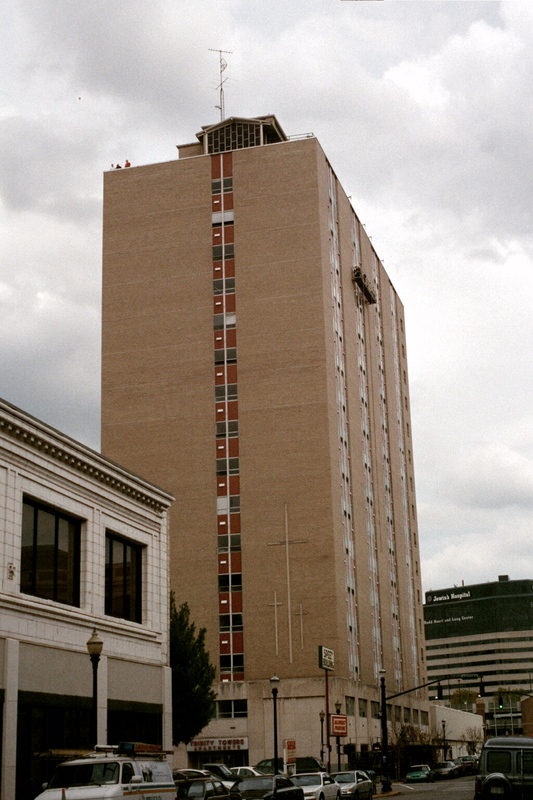 When Whittemore Associates moved here in 1965, they brought with them the light carillon which had been on the façade of their Boston building since 1951 (see above). Sometime in the 1970s (when? 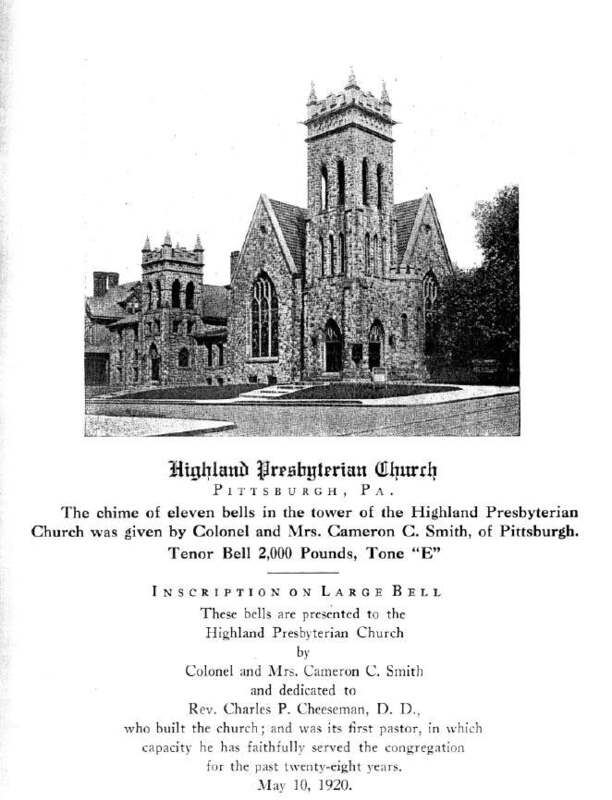 ), the company sold the carillon to First-Calvary Baptist Church, which was at that time in Lawrence, MA (see above). This church moved to Holland, PA in 1968 and brought its carillon along. It is now Trinity Reformed Church, UCC. Some of the bells of this two-octave carillon, cast in 1930 by Franz Schilling Sons of Apolda, Germany, were lost before the church closed about 1973. The remaining bells are now part of the automatic carillon at The Lutheran Home of Germantown. The three octave traditional carillon of Saint Monica's RC Church in Santa Monica was dismantled in 1971 because of fears for the tower's stability in earthquakes. The bells were later transferred to Mission San Fernando, where they were played only automatically. In 2002 they were moved again, to the newly-built Cathedral of Our Lady of the Angels in Los Angeles. See Ward-Belmont School, Nashville, TN, above. The Netherlands Carillon was located in a temporary wooden tower here from 1954 until it was installed in a permanent tower in Arlington, VA in 1960. The Pepsi Carillon, a travelling carillon built in 1967-70 with bells by Petit & Fritsen, was disassembled in 1982. The frame and keyboard went to the Hall Estate (see above), acquiring a new set of bells to form a new instrument; the original bells went to the Cathedral of the Assumption, Louisville, KY.
A 16-bell automatic chime was installed in 1979 by P&F, as part of the York Road Development Project. Two lightning strikes silenced the mechanism, and it sat idle for several years. In 2007, 12 of the 16 bells found a new home several blocks away. The disposition of the other four is unknown. The Jones foundry installed a light 10-bell chime here in 1860. In 1953 the property was sold to the Ukrainian Orthodox Church of America; the bells were removed, and were installed two years later at St.Mark's Episcopal Chapel, Storrs, CT. In 1882, McShane installed a chime of unknown size here. The exact name and location of this church are uncertain, but it may have been St.Mary of Sorrows, also known as the Church of the Seven Dolors, Genesee and Rich Streets; that is now the M.L.King Urban Life Center. In 1982, eight bells from that chime were installed in a park in Warren, PA. This amusement park (which opened in 1897) contained a Chimes Tower holding 10 bells by Meneely/Troy; it was played hourly from a chimestand in a cabin far below the open belfry. The bells survived a fire which destroyed most of the park in 1907, and in 1909 they were transferred to Our Lady of Solace Catholic Church, Brooklyn, NY (see below). An 11-bell chime was made by Meneely/Troy in 1914 and installed in a freestanding tower on the estate of J.C.Sibley. In 1948, the farm was sold to the White Fathers, who in 1967 sold the bells to the newly-built Church of Our Lady of Anjou in Montreal, Canada. A 10-bell chime was installed here by Meneely/Troy in 1881. In 1936 this became Plymouth-Piedmont Congregational Church. In 1941 that building was razed. 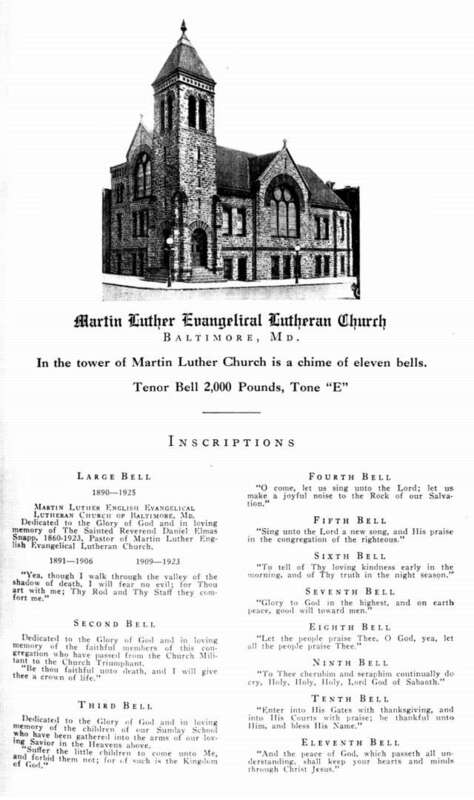 It is not known when the bells were sold nor where they were stored, but in 1952 they were installed in St.Ann's Catholic Church, Cleveland Heights, OH. A lightweight 25-bell traditional carillon by Petit & Fritsen was installed in 1953 in the triangular Trinity Tower. In 2008, the pastor sold the bells to Chime Master, who dispersed some of them. The bell frame, transmission and baton keyboard were junked. A 25-bell Petit & Fritsen carillon, probably lightweight and automatic, was installed in 1994. In 2002, Verdin bought the bells back. Twelve of the bells of this little carillon were sold to Middlebury College, Middlebury, VT to expand that traditional carillon. The disposition of the remaining 13 bells is unknown. A 31-bell non-traditional carillon installed by Petit & Fritsen in 1982 was removed by 2003. The disposition of these bells is unknown. A very light 25-bell automatic carillon was installed in 2000 by Meeks & Watson, using bells that had been removed from Elsah, IL. When the owner was forced to move elsewhere, about two years later, he sold the bells and freestanding tower back to M&W. Some of the larger bells were dispersed, while the remainder are in storage with the tower. Advertising material from the Blake foundry claims that they cast the first American-made chime in 1825. Given the known history of the foundry, it seems more likely that this is a typographic error for 1852. (But see Mechanics Fair, Boston, above.) It has also been suggested that this was a recasting of a foreign-made ring or chime. In any event, this chime has not been located and its disposition is unknown. A 9-bell chime by Jones was installed in 1870. In the late 20th c., it was dismantled and the bells were given away singly to other churches. A ring of six bells was cast in 1804 by Thomas Mears of London (Whitechapel), and was installed in the first Christ Church (at Baltimore and Front Streets) in 1805. During the War of 1812, the bells were removed to be hidden from the British. After the war, only three of them could be found; they were rehung in the same building. Thus the six-bell ring lasted for less than ten years. In 1835/6, Christ Church moved with its bells to its second building (location unknown). 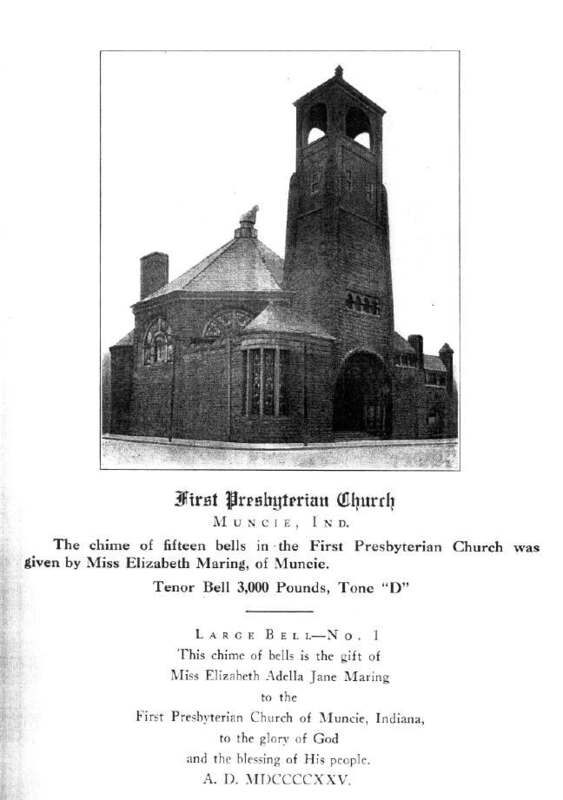 In 1871, the congregation moved to its third building (the present location), taking at least one of the Mears bells with them; possibly one was left behind in the second building, which was then renamed Church of the Messiah. In 1904, the Church of the Messiah was destroyed by fire, but some metal was recovered from the bell which hung there at the time; it is not clear whether this was one of the original Mears bells. In 1908, Christ Church bought a chime of 13 bells from the McShane Bell Foundry; at that time at least one Mears bell was returned to the (now rebuilt) Church of the Messiah. In 1920 the Messiah congregation moved to its present location on Harford Road, and in 1922 McShane cast for them a new bell made from (a) the metal of a Mears bell returned in 1908, (b) another bell which had hung in St.Andrew's Chapel, Harford Road, Hamilton, and (c) the bell metal recovered from the fire of 1904. The inscription on that bell records part of the history given above. It is not clear what happened to the other two Mears bells which had been recovered after the War of 1812, though perhaps one passed through the 1904 fire. This ring does not have a separate entry in the database, since it had fewer than 8 bells; the later chime does (see above). Six bells were installed by Meneely/West Troy in 1856. Later in the 19th c., five more were added, yielding an 11-bell chime. 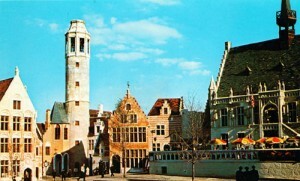 In the 1960s the tower was condemned and most of the bells were sold. Four remain on an open frame, striking the quarter hours. In 1930, Meneely/Troy installed 10 bells in this memorial to 27-year-old Florence Abbott Ivie, daughter of Alvine Ivie. Its early usage is unknown, but by the late 20th century the building had no regular congregation, and Episcopal services were held there only in the summer. It was closed in 2007, and the bells were bought by Chime Master Systems. Although they were offered for sale as a set, no buyer was found, and the bells were eventually sold off individually - the last in late 2011. Meneely/Troy installed 10 bells in 1925. In 1996, the church tower was taken down and the bells were sold. Their destination is unknown. Henry N. Hooper of Boston made a chime of 16 bells for this church in 1868; they were given by the granddaughter of one of the settlers who founded Charlestown. The chime was destroyed by fire in either 1934 or 1957, depending on how you read a history of the various "First Church" parishes in this town or an independent history of this church. An 10-bell chime was installed by McShane in 1883. In 1900, the town of Elkins Park was formed from Cheltenham Township; the church is within its boundaries. The chime was sold in the 1960s; the buyer is unknown. Vanduzen was reported, by a usually reliable source, to have cast 9 bells for the M.E.Church of Clinton, IN; but the associated Zipcode was for Clinton, IL. Visits to the Methodist churches of Clinton, IN, and Clinton, IL, proved that neither of those buildings could ever have held such a chime. Discovery of a Vanduzen catalog from 1922 revealed that the destination had actually been Clinton, IA, and the total weight of the bells was 6067 lbs., but no date was given. The First Methodist Church of Clinton, IA, erected its present building in 1903, and originally it had a round corner tower with belfry that might have held these bells. (Or it might have held only the single bell which the church had in its previous building.) The belfry was removed from that tower in the 1920s because of continued problems with leakage, and present church members have no knowledge of what it might have held. The bells are presumed to have been scrapped. A collection of 11 assorted steel bells (origin unknown) sat in an old farm wagon outside this cafe for years. After the cafe closed in 1996, the bell wagon was traded back to the antiques dealer from which it had been obtained, and sat in front of his shop until he died, a decade or so later. It is not known what happened to the bells in the estate sale that followed. Meneely/Watervliet made a 12-bell chime (in concert pitch) for this church in 1921. Some time between 1946 and 1957, it was replaced by an electronic device; the fate of the bells is not known. A bell from Rudhall of England was installed in 1751; later this was augmented to a ring of 4. Some years after the Revolutionary War, the church was disbanded and the bells were dispersed to other churches in South Carolina. This site is not in the database, since it had fewer than 8 bells. Meneely/Troy made a 10-bell chime for this church in 1921. When the church moved out of downtown in the 1960s, the bells were sold, but the purchaser is not known. An 11-bell chime by Meneely/Troy was installed in 1902, incorporating a bell which had been delivered in 1882. Weakness of the tower led to its being shortened in 1961; the bells were sold, but the purchaser is not known. Meneely/Watervliet reportedly made a 9-bell chime for this place, but details of date and weight were not given. A search of the town in 2009 found no trace of the chime nor of any building which might have held it. Thus the accuracy of the original report is now questionable. A 9-bell chime by Meneely/Troy was installed in 1893; the bells apparently disappeared during World War II. was designed to be essentially identical to the old chime tower. A chime of 9 or 10 bells, installed by Jones in 1870 or 1871, was removed in 1924, reportedly traded in on a 16-tube Deagan tower instrument. A 9-bell chime of unknown make and vintage was sold to the Verdin Company, date and ultimate destination unknown. An 11-bell chime by McShane, of unknown date, was sold in 1994. The buyer is unknown. In October 1915, Meneely/Troy installed an 11-bell chime atop the Bible Institute building in downtown Los Angeles. Some time in the 1960s, it was taken down and put in storage. In 1986, five of the bells were installed in an open clock tower on the new campus, with Westminster quarters struck electrically; the university has a 33-minute video of the dedication of the bell tower. The disposition of the other 6 bells is unknown. The bells are pictured on a page about donating to the university. An interactive campus map shows exactly where the bell tower is located. A page about the top 25 stories of the past 25 years includes (at No.9) a paragraph about the bells and a small photo of the complete tower. A light-weight chime of 9 bells from Jones was installed in 1860 for Rev. Alonzo G. Shears, who was rector of this school and assistant at St.Thomas Episcopal Church from 1855 to 1874. It is known that the school was located on Dixwell Avenue, but no evidence of its later existence has been found, so it is assumed that the chime was eventually scrapped. A ring of 8 bells from Whitechapel was installed in 1861. All but the third (as counted by ringers) were destroyed by fire in 1898. A 10-bell chime installed by Meneely/Troy in 1940 was removed from the tower (now owned by the Immanuel Bible Foundation) about 1971 because its substructure was failing. The bells were traded to Verdin for an electronic device, which was thrice destroyed by lightning. The original chimestand may remain in the tower. A ring of 8 bells by Whitechapel (of unknown date), which originally hung in the church of St.Michael & All Angels, Blackburn, Lancashire, England, was installed here as a chime in 1984. When the congregation moved to a larger facility in the same town, the bells and pre-fabricated tower were taken along, but not re-erected. In 2005, the tower was sold to another church and the bells were sold to Verdin, who resold them piecemeal. A 10-bell chime installed by McShane in 1890 was removed in the early 1980s when the tower was taken down because of structural weakness. The bells were dispersed, one remaining at the church. NOTE: Defunct sites for which no database identification is listed are the only ones in their respective cities in the database which supports this Website. Thus their identification follows the standard model. This page was created on 1997/06/15 and last revised on 2019/03/15.